K’uut Bi Ik! Easy to make, easy to love, and not-so-easy to say (the apostrophe is a glottal stop). It’s a little-known chili salsa from Yucatan peninsula of Mexico that combines rehydrated chili peppers with Seville orange juice (or a suitable substitute, see below) and a little salt. Nothing complicated, but it adds a big, bright, bold punch to all kinds of dishes. It’s simple and wonderful salsa, and perfect for those looking for a little (or a lot) of extra heat. You just throw it together when you want to up your taco game to ridiculous new heights. As such, it seems like the kind of recipe that I should stop talking about in order to get right down to the details. Add to that the fact that I’m certainly not the first person to shine a light on k’uut bi ik – this recipe is only mildly tweaked from the version found on the fabulous Serious Eats website, and as such I don’t want to pretend I’m reinventing the wheel in a really big way here. THAT BEING SAID (which is, incidentally, something I say a little too often), while I’m not reinventing the wheel, perhaps I’m putting new rims on. Or… rotating and balancing. This analogy is in trouble, so let’s move on. My recipe departs from the traditional/Serious Eats combination of pasilla and árbol chilies for one exceptionally good reason: smoke. This fiery red dried chili salsa foregoes the pasilla chilies and instead swaps in wonderful, moderately smoked morita chipotles. You see, a lot of great Mexican carne (meat) recipes use smokers, charcoal, or even pit ovens to really rock that smoky, slow-cooked flavour. While more and more people are using home-smokers (or smoker boxes in barbecues), it’s still not something that everybody can do. And if you’re looking to cook genuinely good Mexican food quickly (hello pressure cooker!) the smoke is usually the first thing to go by the wayside. I was, suffice it to say, not ok with this. Enter the beloved chipotle peppers. Beloved by whom, you ask? Well me for starters. And a whole lot of Mexican and Southern US cooks. And hopefully you too, because these things are amazing. By using a smoked chili in your k’uut bi ik, you get a condiment that still delivers all the awesome fruit chili heat, but also brings prominent smokiness to any dish it touches. It’s not overwhelming (more on that below when we talk about chipotles), but it’s definitely there, and it definitely does great things. Now, let’s get down to making this stuff. Words can’t express just how easy this is to make. I mean… I guess they’ll have to because that’s kind of my job and all that. As for how to make this, the instructions below are really all you need. The only tricky bit involves charring the garlic, and even that’s pretty straightforward (you’re basically lighting them on fire… but, gently). Do make sure to toast your chilies and to soak them for a little while, as you definitely don’t want a salsa with annoying flaky bits of dry chili skin in it. Nobody wants that. Like the look of those tacos above? If you’re looking to try it out, that’s my recipe for Instant Pot Carnitas con Queso. It’s a perfect recipe for this salsa. Go ahead and check it out. I’ll wait here. This recipe is, in some sense, a bit of a hybrid between two recipes that are already pretty similar to begin with: the aforementioned k’uut bi ik from Serious Eats, plus another Yucatecan salsa called Chile Tamulado (which has also been covered by Serious Eats – if I was getting paid for this I’d probably owe them royalties). The recipes differ by using dried or fresh chilies, and the SE Chile Tamulado recipe uses fire-roasted garlic. I looooooove me some garlic, so I decided to incorporate it in my k’uut bi ik recipe. That being said, you can totally omit it if you’re not in the mood, or if charring garlic seems like too much work (I have a gas stove, so it’s a snap). If you do choose to omit the garlic you can expect a somewhat sharper, fruitier, more chili-centric flavour. Still very good, just a little different. Needless to say, the chilies are pretty important here. Right out of the gate I’ll cover this point: you could use any good dried chilies that you like to make this, and you’d end up with a tasty salsa. But if you’re looking for a nice balance between chili-heat and smokiness, I do recommend you track down árbol and morita chilies. The árbols are a pretty standard hot red chili with a nice fruity profile. If you’re looking for substitution ideas you can check out the link to the Pantry Page here. Morita chilies are one of two types of chipotle pepper. Moritas are distinctively purple-red, with a fairly glossy skin and a smoky, but not overwhelming scent. The second type, the chipotle meco, is a papery, tobacco-brown colour with a much stronger, distinctive smoky flavour. Chipotle mecos are great, but they can be overwhelmingly smoky. If you can’t find morita peppers but you can find chipotle mecos, use one or two of those in place of the moritas. For more on chipotle peppers and how to find, choose, and use them, check out this Pantry Page all about the subject. One of my favourite ingredients, this recipe (and this one) is a fantastic reason why you shouldn’t be afraid to try a new fruit when the opportunity arises. They’re not always easy to find however, so if you can’t track them down, you can substitute at 1:1:1 mix of grapefruit, orange, and lime juice. The flavour isn’t an exact substitute, but it will do the job nicely. For more on finding, choosing, and using Seville Oranges, check out this Ingredient Page. GOOD NEWS:This is the perfect condiment – tons of flavour, with almost zero added fat or calories. It’s a great way to spice up (literally) all kinds of dishes. BAD NEWS:Nothing at all! You could eat this by the spoonful – though I wouldn’t recommend trying it unless you’ve got a fire-proof tongue. Nothing finishes a good Mexican recipe like a really great salsa. While cooked and fresh salsas are wonderful, it's hard to beat the simplicity and impact of k'uut bi ik - a Yucatecan salsa made from dried chilies and Seville orange juice. This variation incorporates garlic and smoky morita chipotle to give it a deeper and more rounded-out flavour. (Optional - skip if omitting garlic) Thread the cloves of garlic onto a metal skewer, then carefully roast/blacken them over an open flame (I use a gas stove, but you could use a barbecue too). If you don't have a flame source, you can blacken the cloves in a very hot cast iron pan instead. The idea is to thoroughly char the cloves, but not to roast them all the way through. Set the charred garlic aside to cool. Remove the stems, seeds, and membranes from the dried chilies. You may find it easier to do this after toasting; I personally shake out the seeds before and after to remove as many as possible. Toast the chilies by either adding them to a hot frying pan for about 2 minutes (turning occasionally), or by microwaving them for 20-30 seconds. The toasted chilies should be pliable and very fragrant. Place the toasted chilies in a small bowl along with the Seville orange juice (or citrus substitute), vinegar, and salt. Soak for about 10 minutes. Peel the garlic (if using) and combine with the chilies, juice, vinegar, and salt in a blender, spice grinder, or mortar and pestle. Blend/pulverize until the salsa is uniform. Add a little water for a thinner consistency, if desired. Let the salsa sit for 20-30 minutes if possible in order to balance the flavours. If you are able to find Seville oranges you might find that the vinegar is either unnecessary or too strong. Taste the juice and see if you think it's acidic/bitter enough, and consider adding a little less vinegar or a milder vinegar like white wine vinegar. You may want to add a little extra water to make up for the reduced volume of liquid. Glad you like it Lisa! And I certainly understand your reluctance when it comes to mole, though it is worth noting that there’s a whole world of different mole types out there, and many of them are much easier than you might think. Some of the classic Oaxacan moles are definitely on the complex side, with ingredient lists a mile long, but many are very doable in an hour or two! Wow Sean, this recipe sounds beyond fabulous! There are so many dishes this could be added to to really kick them up a notch. Right now I am picturing the Chickpea Tacos from Thug Kitchen with this, outstanding! And I am totally going to make some charred garlic if I can find the peppers to make this. A trip to Edmonton is on order for peppers and seville oranges. Thanks Redawna! I agree completely – this is a great little salsa for all kinds of recipe. The Thug Kitchen tacos sound like an AWESOME place for k’uut bi ik to work its charms. Good luck finding the ingredients, but don’t kill yourself looking for the Seville oranges (though they are in season right now). The grapefruit/lime/orange substitute works beautifully. And as for the chilies – well, they can be pretty hit-and-miss in stores, but online shopping has made them pretty darned accessible now. Cheers! This salsa looks HOT. And therefore delicious. I almost thought it was a chili paste at first glance. I love the use of orange juice here! Homemade salsa is the way to go, but we never really know that until we have it! It wasn’t until my sister in law made it where I realized what I was missing out on. I want to swirl this good stuff into some plain Greek yogurt and attack it with some tortilla chips stat! Thanks Dana! It definitely packs some heat (and it’s wonderfully customizable, so spice-addicts can go even bigger if they feel like it). The orange juice (or citrus combination) is amazing, and it’s a really cool way to bring character to the salsa that would otherwise be missing. Seville oranges are basically the local substitute for vinegar in the Yucatan, so they add all kinds of character to many different recipes. And I agree with you about the yogurt idea. That sounds amaaaaaazing! Wow…sounds like this would HEAT things up. I know hubby would like it for sure. Love the colour….and I really thought it was chili paste. I would love this on some eggs for breakfast. Get the taste buds riled up for the day. It definitely brings the heat Gloria! Plus you can make it even hotter if you’re so inclined. I’ve got some dried habaneros kicking around that would probably make even the moist die-hard spice lovers think twice before piling on the salsa. Good idea about breakfast too – this would be awesome with eggs! I’m going to have to pay more attention next time I buy chipotle peppers- I thought they were all smoked jalapeños lol! Of course they aren’t- it makes total sense that there’s more than one kind. I need to find the peppers and make this- the hubs LOVES hot salsa! Hey Sarah! You’re right – all chipotles ARE ripe jalapeños. But there are the lightly smoked ones (morita chipotles) and the heavily smoked ones (chipotle meco chilies). There are other smoked chilies out there too, but they’re generally a lot less common. I hope you find what you need to make it, and I hope the recipe gets a thumbs-up from you and hubby! I can just imagine how delicious that salsa is just by looking at your beautiful photos. So thick and robust and flavorful! I can’t wait to make it and spread it on, well just about everything!! Thanks Elaine! I’m glad you like the shots and the recipe. Cheers! I love Serious Eats as well. Such an amazing resource. This sounds soooo good, and I appreciate the substition for Seville oranges because I don’t know that I have ever seen those! Great post! Yeah, I have to admit, it’s one of the few food blogs I feel comfortable turning to time-and-again when I’m researching. Glad you like the post, and I hope the Seville orange substitute works nicely for you! This truly looks like the perfect combination of chilies. I love the paste and I am imagining adding it into some of my sauces I use for sushi and tacos. Although, I am sure that I would just want to dollop that beautiful salsa right on my tacos, burritos and nachos. Kuu’t Bi it is not something I have tried before, but now I can not wait to give this one a go. Thanks Jennifer! It’s a pretty versatile sauce. Hope you have fun experimenting with it! Wow, does this ever look amazing! I am such a sucker for all types of salsa and this one is right up my alley! I’d love to serve it over my braised beef burritos which would send them over the top. I love the zing of the citrus in the salsa. Looking forward to making this! Thanks Megan! Love your pairing suggestion. That sounds like my kind of recipe for sure. Have fun with it! This salsa sounds so spicy. I just know my Hubby will love it! Saving this recipe so I can try it soon! Hah, that seems to be a common theme in the comments! I think the hubbies of the world need to get together and start finding some salsa recipes to take a shot at. Maybe I should start offering classes. Haha. Cheers! Oh my goodness I could just eat those tacos up!! My oldest is a salsa hot sauce fanatic and this would be right up his alley. I’ve never charred garlic but with a little luck (on not catching it on fire) can see how this would really up the flavor of this spicy salsa combo. Thanks Brandy! The recipe for those specific tacos is now up. 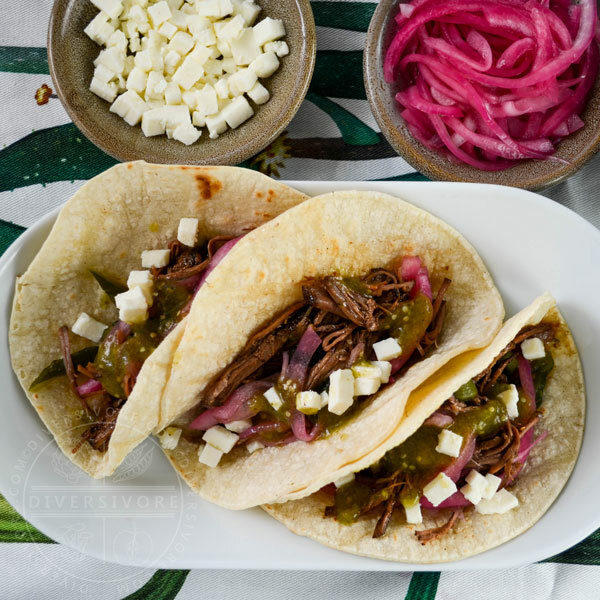 You can check it out here: Instant Pot Carnitas con Queso. And don’t be afraid to try the garlic – even if the skin burns a bit, you still get a pretty amazing end-product. It’s a little bit like roasting marshmallows, so nothing too complicated! And it definitely adds a lot of character to the recipe. Mmmm My mouth waters just at looking at your bowl of chili salsa. I would love to try it on about anything. Now the difficulty for me would be in finding the peppers and oranges, thanks for giving substitutes Sean, I can’t wait to try it! Thanks Patty! My mouth waters… and my eyes might start to water a little bit too. Haha. Glad you like the recipe, and good luck with it. I hope you’ll let me know how it turns out if you do try the substitutes! Cheers. Yum! This simple recipe combines a couple of my favourite flavour profiles and I have some árbols in my pantry right now — definitely trying this one out. Funny, when I see Seville oranges I always think of your recipes! Beautiful work as always, Sean. Hope you had a great weekend! Thank you Justine! I don’t know how exactly I became such a tireless advocate for Seville oranges… but there you go. In fact, I have a bag of them right now. Just found them in town. Guess it’s time to embark on some new recipe development! Haha. Cheers, and thanks for coming by. Thank you Priya! Glad you like it. I hope you all enjoy it! I love a good chilli sauce like this and have several packets of dried chilli in the cupboard to use up. Love the idea of the sour orange juice in it to add more flavour. My fridge needs a jar of this.